The biggest thing when working the windshield is to get the fiberglass as close to the correct shape right from the beginning. That way you have a lot less sanding to do. The front and top were pretty straight forward, unlike the bottom aft ends. Getting them built up enough to cover the canopy and skirt and still have a smooth transition back to metal took a lot of work. Here are a couple of tips that I hope will help with your installation. Before you rivet the windshield onto the frame, paint the inside where it will be covered by fiberglass. Cleco the windscreen in position and put the first row of electric tape into position for the top of the fairing. Now, while you can still easily get to the backside of your windscreen, remove it from the fuselage. Line the inside with tape to match the outside tape. Sand the bottom below the tapelines. Then paint the inside of the bottom of the windshield. This will give you a nice finished look from the inside while flying. 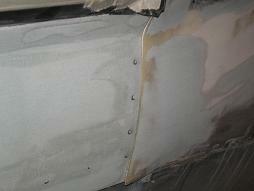 Instead of staring at the back of the fiberglass, you will see pretty paint. Unfortunately for me, I didn’t think of this before I finished the fiberglass. So now I will have to figure out a way to finish the inside of the windscreen without making a mess on the good Plexiglas or the glareshield. I prepared for this fairing by covering the front of the canopy and skirt with wide electric tape. Then I waxed the top of the tape, and slid the canopy closed. I initially put two or three layers all the way around the windscreen, including over the top and the forward edge of the canopy. I also made sure the fiberglass continued down to the bottom of the canopy skirt, but didn’t worry about the fact that is wasn’t a smooth transition yet. After it dried, I worked the canopy loose using a chip chaser to slide below the new fiberglass to pop it free from the canopy. Once it was free, I slid the canopy out of the way, and from this point on, built up on top of the layers. 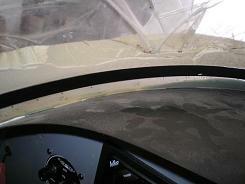 I would slide the canopy back into position to give the fiberglass some support while I sanded. I built the front and bottom of the windscreen until I had the smooth transition to metal all the way around. At the bottom of the sides, I expanded the fiberglass section until it was even with the bottom of the canopy skirt, and filled the low spot with micro balloons and cloth. By using the canopy and the skirt as the “mold” for the fairing, I got a good fit. I eventually cut the back of the fairing to make it about 2 ½” wide across the top of the windscreen and canopy. I built up enough layers of fiberglass to give me 1/8” thickness. In this last picture, you can see the area I extended the fiberglass on the bottom of the fairing and the trimmed rear of the windshield fairing. 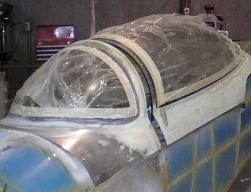 You can also see the forward lip of the canopy that I fiberglassed and will paint. I think it helps finish the front of the canopy, and it also hides the repairs from the bad drill bit. Click here to read more. I still have a little more work to do on the fiberglass. I have a few low spots that need filling. But I wasn’t going to mix up a batch of resin just to fill the little spots. I will wait until I work the next piece of fiberglass. While I have resin mixed for it, I will come back and fill the low spots of the skirt and fairing. Then once all the low spots are filled, I will finish up with a couple of layers of just resin to get that smooth finish.